Vulnerable Republicans have abandoned re-election bids from Florida to California, with more retirements than at any point since World War II, except for 1992. WASHINGTON — The addition of Speaker Paul Ryan to an already long list of retiring Republican members of Congress has made a bad situation worse for the embattled GOP majority. "Ryan's retirement is a sign that the bottom really has fallen out for Republicans," said former Florida Republican congressman David Jolly, who predicted more lawmakers will follow Ryan to the exits after the House speaker announced Wednesday he will not seek re-election. "A lot of Hill Republicans are just miserable right now. That's the constant theme I hear from former colleagues," Jolly said. "The reality is that Trump has just made the environment really, really difficult." Incumbency is one of the most powerful forces in politics, and Republicans are losing it at a nearly unprecedented clip in some of the places where it matters most. On the heels of Ryan's bombshell, Rep. Dennis Ross, R-Fla., announced he, too, will not run for re-election, setting off a flurry of questions and speculation in Washington about who might be next. Vulnerable Republicans have abandoned re-election bids from Florida to California, with more congressional retirements this year than at any point since World War II, except for 1992, according to Kyle Kondik, an analyst at the University of Virginia's Center for Politics. "Democrats should be able to pick up a significant chunk of the 24 seats they need to win the House just from open seats," Kondik said. Republicans now have 39 open seats to defend, compared with 20 for the Democrats. And 24 Republicans have decided to retire without seeking higher office, versus just nine Democrats, according to an NBC News tally. Ryan's own Wisconsin district is a good example of the problem. On paper, the district leans moderately Republican (Barack Obama carried it in 2008), but Ryan has won landslide after landslide since being elected in 1998. As soon as he announced he wasn't running, handicappers moved the contest to replace him from "likely Republican" to a "toss-up." "You take a seat in even remotely swing district range and make it open and it becomes a prime target," said Ethan Todras-Whitehill, the founder of SwingLeft, a new liberal group working to flip the House. Ninety-eight percent of members of Congress won re-election in 2016, according to the nonpartisan group FairVote, which estimated the "the incumbency bump" is worth about 8 percentage points. Republicans downplay the significance of the issue, with National Republican Congressional Committee Chairman Rep. Steve Stivers, R-Ohio, saying on CNN the retirements are "not a big deal." GOP operatives working on House races this year note Democrats have their own open seat woes, like two Minnesota districts that Republicans are favored to carry, and a toss-up in Connecticut where a Democrat is stepping aside after getting caught covering up a staffer's misconduct. And messy Democratic primaries could end up costing the party key open seats, the Republicans say. But in Florida and Pennsylvania, Republican retirements have essentially handed seats to Democrats, while vacancies in California and elsewhere have significantly improved the opposition's chances. And everyone agrees all Republicans have the wind in their faces in November midterm elections. "I think there's a lot of weariness and a lot of exhaustion frankly," retiring Rep. Charlie Dent, R-Penn., told reporters in the Capitol Wednesday. "This is going to be a challenging year." Meanwhile, it remains to be seen if Ryan can maintain his incomparable fundraising prowess, which has been crucial to his party, as a lame duck. "I know the speaker remains personally committed to ensuring (the Congressional Leadership Fund) continues to succeed and has the resources it needs to maintain the House Majority," said Corry Bliss, the executive director of the CLF, a super PAC. 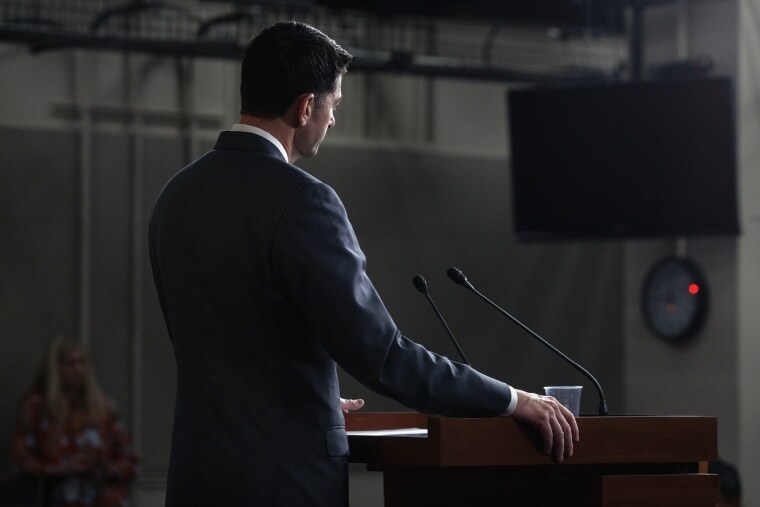 Few expect Ryan's absence will directly move many votes, since Democrats never managed to turn Ryan into a villain the way Republicans have with House Minority Leader Nancy Pelosi. But with Ryan being the most prominent holdover from the pre-Trump Republican Party, his departure may cement Trump's takeover in the mind of voters. Educated suburbanites who might have looked to Ryan for assurance may not be as happy with his replacement. "The next leader of the House GOP, whether they're speaker or minority leader, will be somebody with Trump's fingerprints," Jolly said, "because the only way to accede to power in today's GOP is with Trump's blessing."